If you haven’t bought that box of chocolate for your significant other this Valentine’s Day, you can still find some great values. But don’t expect much of your purchase to go to the sugar farmers who made the sweet treats possible. 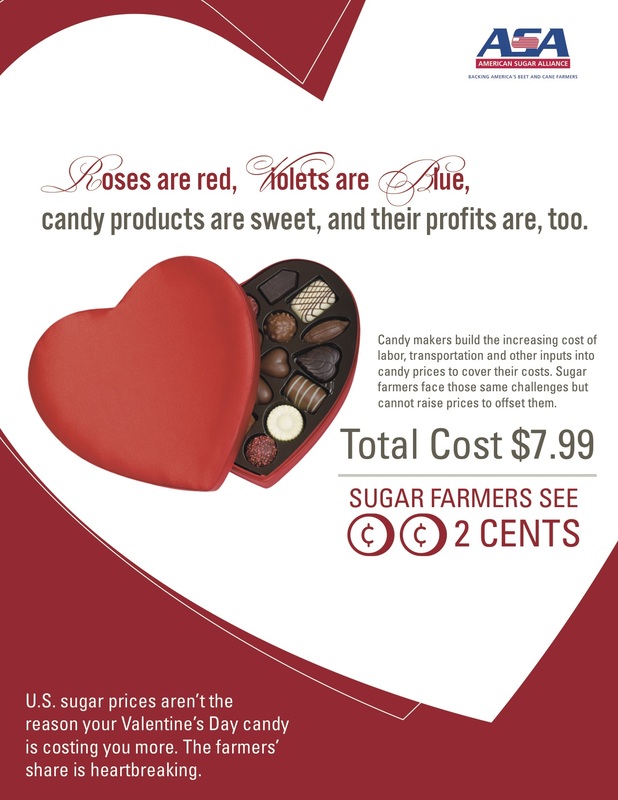 The American Sugar Alliance (ASA) today released an infographic noting that sugar producers see just 2 cents from a $7.99 heart-shaped box of chocolates. ASA looked at other popular Valentine’s Day candies at a local store, and the results were equally as heartbreaking for farmers. Chocolate kisses, which sold for $1.99, contained only 1 penny’s worth of sugar, while sugar accounted for 4 cents of a $9.99 assorted truffle offering. Candy makers build in the increasing cost of labor, transportation and other inputs into their prices. Hammock says farmers face those same challenges but cannot raise prices to cover costs. “We are price takers, not price makers like big food companies,” she said. Despite this fact, food manufacturers are currently lobbying Capitol Hill to further depress sugar prices with a flood of subsidized imports. In fact, a trade association representing confectioners sent out a press release last week calling on lawmakers to pass proposed legislation that’s been dubbed the “Sugar Farmer Bankruptcy Bill,” in agricultural circles. Big Candy’s rationale: it would help lower the cost of Valentine’s Day treats. And as she pointed out, that assumes the big candy companies decide to pass the savings along to consumers instead of pocketing it as profit, as they’ve historically done. Hammock is hopeful lawmakers see through these ploys. If they don’t, she is worried it won’t be long until American sugar producers go out of business and U.S. farmers’ share of Valentine’s Day sales sinks to zero.